Harlow left a full-time job with benefits at McDaniel College where she taught sociology, to work with students ages 11-17 and shifted her focus to those whom she felt have a greater need for her services. HLI is funded by small private donations and Harlow works with no salary. The students’ meals are usually donated by local restaurants and the local schools and community center provide HLI students with a free venue. The biggest expense is transportation for field trips. Each year, Dr. Harlow struggles to find enough funds to stay afloat. While there are other programs that teach kids about the world, what makes this program special is that families are billed based on their income levels. Rodney McClinton, whose sons Tameem and Rodney Jr. have been with the program since 2009, said that HLI is “the best kept secret” in Maryland. Students who qualify for free or reduced meals in public schools pay $35 for an entire year of service, which includes Saturday after-school sessions and a summer camp. The most a single student pays is $120 per year. “This program is a great way to enrich our kid’s knowledge past their immediate environment. We want our kids to be creative thinkers, and socially aware on a global level,” said McClinton. Each summer there is a different theme. On a typical day during the summer session, students have an activity-based lesson on a specific topic. 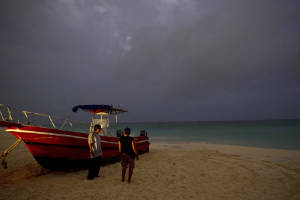 During a daily session, students learn Spanish, discuss current events and play sports. Every week they go on a field trip or participate in a hands-on session with a guest speaker. 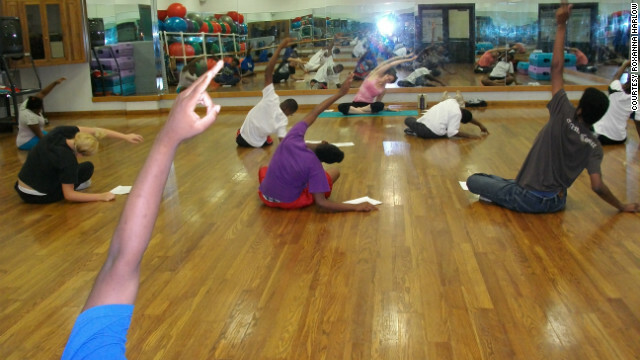 Last summer session’s theme was Food, Fitness and the Environment. Led by college professors and experts, the students learned about environmental sustainability, health eating habits, and natural body remedies like acupuncture. They participated in activities such as toga, Tai Chi, gardening and learned about different cultures. During the school year the students went on college tours and visited places like the Maryland Science Center, the Sports Legends Museum in Baltimore and the Smithsonian Museum of Natural History. And once a year, a group of older students takes a week-long trip abroad. Dr. Harlow applies for grants and seeks out private sponsors to cover each student’s travel costs. Ryan and his brother Kevin, 13, were among a group of students who travelled to Managua, Nicaragua, this past August to explore the country’s culture and history as well as practice their Spanish. They said that they are now more aware of the world around them. While the program mainly targets the needs of low income families and students of color, it is not restricted and offers the students cultural diversity. 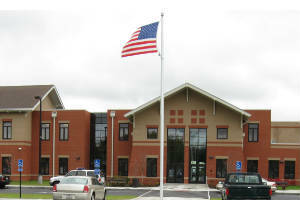 Each student also comes to the program with a unique set of academic and emotional needs. Dr. Harlow said that HLI is a place where some students can escape issues in school and at home and “just be kids” and for others, the program builds their self-confidence and allows them to explore skills they excel in, as opposed to dwell on things they struggle with in school. Mischka Johnson, 15, has been with HLI since the program began in 2009. “Mischka underwent bullying and harassment for a while, so a member of the school mediation team introduced me to the program with a hope that it would be therapeutic for her,” said her mother, Susan Burke. 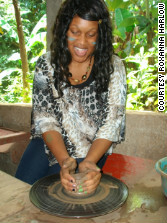 Student Mischka Johnson learns how to make pottery on an HLI trip to Nicaragua. Michael Arthur, 14, came to the program during a time when he was adjusting to a new school. His family moved from Prince George’s County, MD, a mostly African American area, where he was an honor roll student, to Westminster, MD where Michael was one of two or three kids of color at school. At first, Michael struggled with some of his classes and his teachers. After two years with Dr. Harlow, Michael says he has acquired a strong and broad knowledge about other cultures, world issues and has learned new things that he may not have experienced without HLI. He said that this knowledge has made him well-rounded and has helped him improve his ability to handle upper level classes. “Michael’s participation in HLI has made him more active in group activities and he has also become much more comfortable in communicating with a wider range people in the society around him,” said his mother, Sandra Arthur. Burke spoke of a similar change in her daughter after three years at HLI. Sir my friend said that American military jeeps auction in pakistan khi who selling this jeeps its very terrible b/c already used by American Mly..
Sir Is that all african american looks like same like her picture in this blog why every black lady like mrs barak obama n i am sitting over same heads..